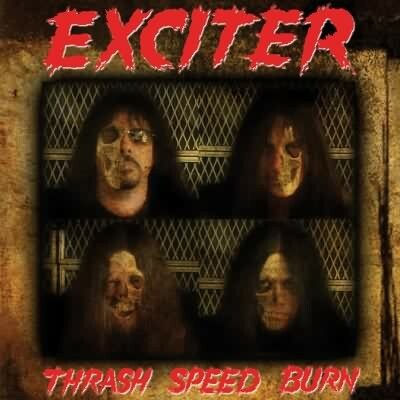 Seasoned thrash metal band Exciter are back with a new album appropriately titled ‘Thrash Speed Burn.’ They’ve never been the most popular band on the circuit but they’ve got a loyal albeit small fanbase that has seen them through harsh times. Led through various line-ups by guitarist John Ricci, these Canadians are usually reliable when it comes to new material. ‘Thrash Speed Burn’ is their tenth opus and was initially scheduled for release in December 2007 until it was pushed back to January ’08 and again it was pushed back to March ‘08. This is the first new album since 2004s ‘New Testament’ which was just a recording of old Exciter songs. The current line-up features singer Kenny “Metal Mouth” Winter, guitarist John Ricci, bassist Rob “Clammy” Cohen and drummer Rick Charron. It would be cynical to assume their best and creative days are behind them and that they’d never repeat the success they had from their 1983 debut with ‘Heavy Metal Maniac’ to 1988s ‘Exciter (O.T.T. )’ but that is probably the case considering the competiveness in the genre and the fickle state of the industry. Nevertheless ‘Thrash Speed Burn’ is a good album with a couple of excellent songs. Okay, the production isn’t great and Winter isn’t the best of singers (not bad but not great) but songs like the opener ‘Massacre Mountain’ and ‘Demon’s Gate’ show that what they have to offer maybe clichéd but it is worth listening too. On a technical level the musicianship in thrash music is notable for the quick changes in chords and the speed and flexibility of the playing. John Ricci is an underrated guitarist; his playing on this album is something to take note of. Not a great album, but certainly something refreshing from the band.